The complaint in the Ashaiman assault case, Mr Adamu Seini Mansu, 28, a mobile phone repairer, has finally decided not to pursue charges of assault he had earlier on made against former President Jerry John Rawlings. Mr Mansu is also known as Tony or Fuseini. He told Daily Guide on Tuesday evening that, his decision was borne out of deference to what he describes as the former president's grey hair and those of his father, whose tireless efforts in having the matter resolved amicably, he had had to oblige. Until Fuseini's latest decision, the Police Criminal Investigations Department (CID) had launched investigation into the matter, following a complaint lodge by Fuseini, himself which led too the invitation of the former president by the Inspector-General of Police (IGP), over the matter. Fuseini, as he is popularly called, added that, his decision was not influenced by money, but purely by the factors stated earlier. The former president was alleged to have manhandled the 28-year-old mobile phone repairer who operates in Ashaiman, but resides in Adabraka, during the recent registration exercise, a case which assumed a high-profile treatment in the media for upwards of a fortnight. Matters reached a crescendo when the former president called the bluff of the Police Administration, by deciding not to honour an invitation from the Inspector-General of Police to appear at the Police Headquarters, after the victim had reported the matter to them. Fuseini narrated to Daily Guide that on that fateful Thursday, March 25, 2004, as an NDC supporter partaking in jubilation at the sight of JJ who was touring registration centres in the Ashaiman area, a man, he claimed he was setting eyes on for the first time, he was beckoned by the former president to approach. Unexpectedly, Rawlings, he went on, held him by the shirt and pulled him toward himself, and gnashing his teeth uttered the following words: “you are a bad boy, you don't respect”. 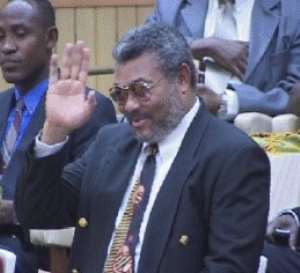 Rawlings was reported to have been angered by the making of a rude gesture by Fuseini. Another version has it that somebody in the crowd had enacted the 2000 elections mantra of “asieho” with the thumb down sign of the New Patriotic Party (NPP). After this initial assault, Fuseini was sent falling to the grounds at which stage, one of the guards followed up with some blows on his back, he stated. The special aide, he alleged, as the assault went on, rested his head on the steering wheel of the vehicle of which he was the driver, a detail which Mr Smith disputed. Fuseini was scathed at the end of it all, with a shredded shirt and lost buttons, to show. At the end of a long-drawn media altercation on the subject, Mr Smith disclosed that their office was ready to apologise to the man, and even compensate him for the trouble. The victim still smarting from the effect, of the alleged assault, refused to have anything to do with the office of the former president at the time. His shirt which bore the tell-tale evidence of the encounter with Rawlings was immediately whisked away from him by his father who detested the publicity glare the case was assuming, but had to let go off it when the CID requested for it.